Will your logo be next? Lean Construction and its associated tool, Last Planner have been highly successful in the New Zealand infrastructure environment. Take-up of the concepts began in 2009 when Constructing Excellence NZ first introduced the concepts into New Zealand. Since then, many projects have reported a range of benefits, not least the Manukau Harbour Crossing project completing 7 months ahead of schedule and one large contractor reporting a 30% increase in profitability since using Last Planner. 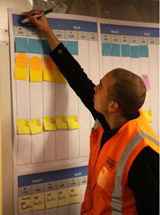 Organisations such as Fletchers, Fulton Hogan, NZTA, Arrow International and Naylor Love and now use Lean Last Planner, often as a standard approach for their projects. Last Planner is a methodology which empowers a collaborative culture of planning and enables a team to manage programme risk on a daily basis.